Step 1: Sterilized you materials in a hot-water bath (place in boiling water for 10 minuets, then set on a clean towel to dry). Step 2: In a glass or metal bowl, add essential oil and carrier oil to dilute it. Add the Epsom salt and sea salt and mix thoroughly. I added one drop of coloring to make the mixture a soft pink. Mix thoroughly. Step 3: Scoop into a 8 ounce (about 1 cup), wide-mouth container. To use: Pour or scoop a fourth of the mixture under warn running water. Allow the tub to fill before sinking into the soothing waters. Enjoy! The recipe is for one 8oz. 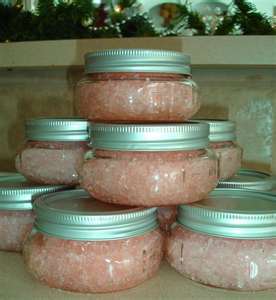 jar, which is enough for four baths. I doubled the recipe several times over and made a dozen of these to give away. I added a label to the top of each jar, and instructions on a tag that I tied on with a ribbon. I then put tissue around each jar and placed it in a large cello bag, tied it with a ribbon and added a small ornament. What a fun festive gift to give to all of your friends!